Is it really that difficult to button a jacket up correctly? It would appear so from a swift look around the Square Mile. Simply put, a bottom button should never be buttoned, that goes for jackets and waistcoats – unless of course you’re stepping out in a single-buttoned piece, then the choice is out of your hands, metaphorically speaking. Two-button jacket? You only need the top one done up. Three buttons? The middle and, at a push, the top one also. Four Buttons? Get yourself a new jacket. t to be buttoned up entirely and pulls in unsightly places when done so. On the subject of buttons, don’t leave them done up when you take a seat, it’s not good for appearances or the life of your tailoring. Always unbutton when sitting down, always. A minor detail, but one that makes a difference. A half-inch of shirt-sleeve should be making an appearance at the end of your jacket. If not, either you’re jacket is too long or your shirt too short – sort it out. The biggest of sartorial sins, nothing ruins an ensemble quite like a too long trouser – there’s just no recovery from this one. Have your tailor hem the legwear so it touches the top of your laces – no lower, or risk a case of ankle pooling and whispers behind your back. Everyone loves a good pocket square, maybe even a tie bar, at a push a pocket watch, but all of these together? Not so much. Accentuate but don’t go over the top. Pick a maximum of 3 accessories and don’t overcompensate by making them the boldest they can be. Sometimes a clean white pocket square a la Don Draper is more effective then a primped up paisley handkerchief. Between shoes, watchstraps and belts, it’s fair to say leathers often form a key part of the suiting-supporting cast. Ensure these embellishments aren’t letting you down; keeping them on-point could be the final piece to your tailoring puzzle. Matching leathers is fundamental when it comes to style yet so many let this one slip. 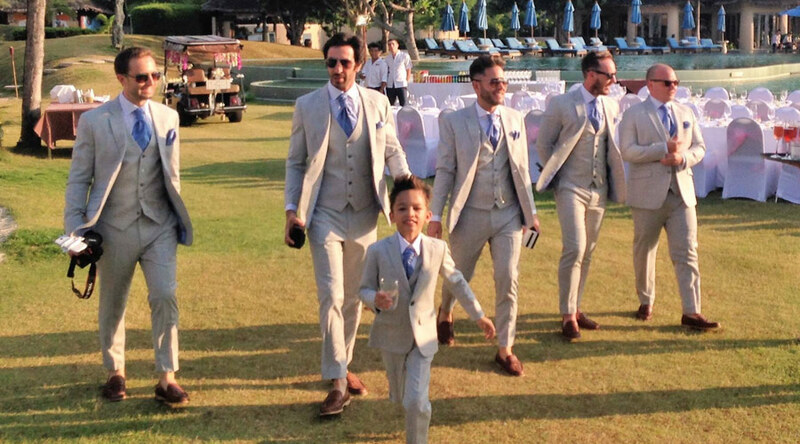 Keep it in the same colour family and not wildly different shades and you and your suit will be fine.